Group Bull is like a hundred people online game as likely to the poker game. Banker/player through the comparison of the card in hand determine the winner. Player who meet the requirement stated can apply to be a banker. Banker did not have to place bet, just wait for others player to place their bet. Each bet area is given 5 cards to be compare. Choose bets > Make Bet > Play Card > Compare Cards with Banker > Payout. Card Combination : 5 Little Bull > 4 Boom > 5 Flower Bull > 4 Flower Bull > Double Bull > Bull > No Bull. Bull Order : Bull 9 > Bull 8 > Bull 7 > Bull 6 > Bull 5 > Bull 4 > Bull 3 > Bull 2 > Bull 1. 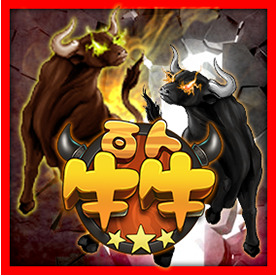 Payout Rules : Double Bull will be x 10, Bull 1 ~ Bull 9 corresponds to the Multiplier of x1 ~ x9 No Bull x 1. Suit Order : Spade > Heart > Club > Diamond . When players have the same value of card at the same time, system will automatically compare the largest card on hand before winner is decided. If the largest card is of the same value then suit will be compare to decide the winner. Note : If joker act as wild, then it belongs to the type of card as the smallest card. If joker value as 10, then will not act as wild. No Bull, 3 cards added up and not 10. Bull 1 ~ Bull 9 = 3 cards added up as 10, and other 2 card sum together. (Joker as wild, J,Q,K,10 as 10 and A as 1). Double Bull = 3 cards are added as 10, and the remaining two are added as 10. 4 Flower Bull = Hand card as 10,J,Q,K,Joker for any combination, and the combination can only have one 10. 5 Flower Bull = Hand card as J,Q,K,color,black joker for any combination. 5 Little Bull = 5 cards which average not greater than 5, and the sum of those cards is not greater than 10.